Our attendee make-up is over 40% buyers, so there is minimal time wasted qualifying leads! Each exhibitor has the same size booth, all in one hall, putting every company on an equal playing field to influence the buyers. All day dining opportunities throughout the show floor, from our Bistro Café, to Central Park and the Celebrity Chef area, to Culinary Innovation Stations, Hot Dog Stand and many other opportunities. 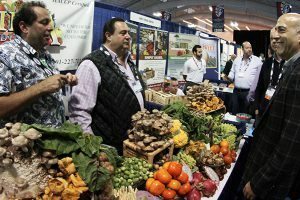 No one goes hungry at The New York Produce Show! Educational seminars concurrently run throughout the show, so you can take a break and listen to the latest research results coming from one of our famed Ag University speakers. Private meeting rooms on the show floor for retail and foodservice company meetings. Connect with Fresh consumer media program to give you all-day access to influential bloggers, food journalists, and broadcast media. After all, New York is the media capital of the world! Special appearances by sports celebrities and city officials. Don’t be surprised to run into a hall-of-fame New York athlete or a city council member who might be walking through the show floor. 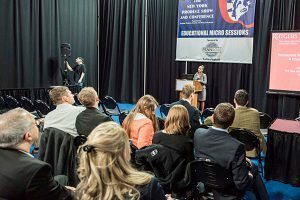 In addition, the organizers of The New York Produce Show and Conference — the EASTERN PRODUCE COUNCIL and PRODUCE BUSINESS — will be pulling out all the punches to keep the excitement going on the show floor!